from the 1959 book, introducing the B20. typical illustrations – just gorgeous. We like our cars, but the Lancista gets really excited about their parts books. There, in full detail, Lancia told the story of the car in illustrated wonder. All the parts to the car are shown there, but there is more, lots more. 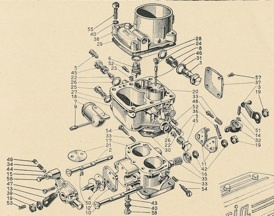 First, there is the assembly notion – the parts book actually shows how the cars go together. All the little bits, and even sometimes you can get a sense of sequence, surely of purpose for all the parts. 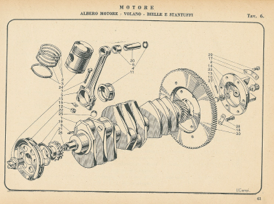 Second, there are the wonderful illustrations in the parts books. Done by a man named U. Ciompi, who is rumored to be a friend of the family and a wonderful illustrator. I seem to recall a story in Viva Lancia about him years ago. Anyone have a copy? 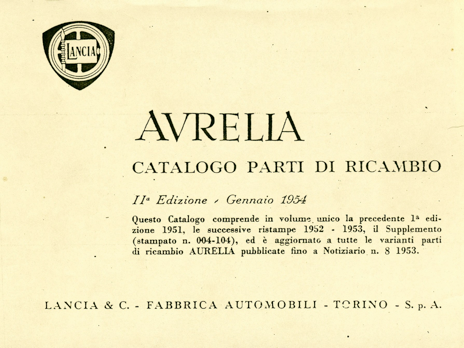 The book is typically divided into sections, each for a model, starting always with the Berlina, then special sedans or chassis, the B20, and finally the open cars. 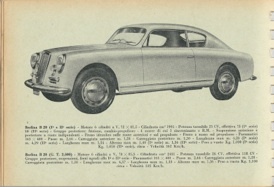 After the Berlina, each section typically has only text pages noting the changed elements, unless the change was significant enough to warrant a new illustration. Hunting between text changes on the B20 (for example) and the illustration of the application on a Berlina can be a workout at times! The details on each Tav (sheet) of the parts book tell when the part was replaced or changed – typically by serial number, and sometimes by engine number. These records are quite meticulous, and for the Aurelia owner in the midst of winter, serve to pass the time, as they ponder what changes happened when and for what reason. Those of you in warmer climes are driving your cars instead. The origin number indicates when the part first came into being – typically 800 for B10, and 803 for B20, but there are some surprises – some parts comve from Appias, Ardeas or Aprilias, or even trucks. 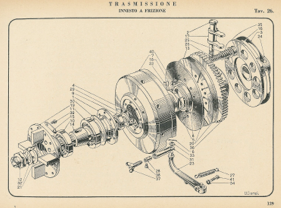 There are some other wonderful bits to be found – sometimes, Lancia would give an assembly number, each part number, and a casting number as well. Careful scrutiny can lead to more mysteries (7 different engine block castings, for example). Where to get one of these wonders? Sometimes they show up on Ebay, and are not cheap. The easiest way is to get the CD from Huib, which has several on disk already. Finally, how many of them are there? Well, its a bit unclear as of yet. The first parts book is from 1951, and the definitive one for the early cars is called a second edition, dated January 1954. It uses the old parts numbers, far more friendly and intimate than the later numbers. 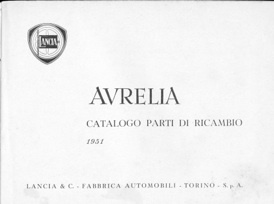 For the second series cars (Berlinas), such as the B12, later B20 and B24’s, the parts book is again issued as the second edition, dated August of 1959. Typically, the 1959 book is used on the later cars and replaces the earlier one entirely. One does not need to go back and forth. Just for fun, the tav numbers in the second edition are one off from the earlier edition. 1959 – for B12, GT 2500 (B20 s.4-6), Spider,convertible. This has the new part numbers and the cross-index to the old ones. It does not include the earlier cars, tho. I have a very early parts book, still in draft form, from September of 1950. Its titled: “Distinta provvisoria”, and is without illustrations. Curiously, the tav for the carburetors is not included, to be developed later. Looking through this book without illustrations, one can see that the part numbers on each Tav (starting with 1, and going up) are not assigned by any magic formula – but rather simply alphabetically! Took years to find that out! Also, a 1956 parts book has been seen. It has all illustrations first, and then the text pages, and covers the B12, B20’s to s. 6, and the B24’s. Curiously, it has all the old part numbers. They must have been just getting around to changing them then. If anyone has a 1951 or 1956 Parts book, or any of the supplements (like 1953) they’d like to part with, I’d be interested in hearing from them. A 1959 book in trade?